In case you weren’t able to join us, here are some photos from our recent show at the Westlake Porter Public Library. The display including LEGO creations by several NEOLUG members and an interactive LEGO mosaic build which was completed by library visitors. If you’re headed out to the Cuyahoga County Fair this year, be sure to stop by the NEOLUG display and say hello. We’ll be displaying our creations and hosting interactive events starting Thursday, August 10th and ending Sunday, August 13th. The fairgrounds are located at 19201 East Bagley Road, Middleburg Heights, OH 44130. For more information about this year’s fair, visit the Cuyahoga County Fair’s website. Come see NEOLUG at the Westlake Porter Public Library! On Saturday, July 22, 2017, NEOLUG will display amazing LEGO creations at the Westlake Porter Public Library. The event is scheduled from 10:00 AM to 3:00 PM and it’s free and open to the public. In addition to viewing LEGO creations, visitors of all ages can participate in NEOLUG’s collaborative LEGO mosaic build (all day long) and children ages 3-12 can build their own LEGO and Duplo creations at the library’s special event called “Brick Builders” happening at 2:00 PM. No registration required for any of the events. If you’re looking for a fun way to spend your Saturday, head over to the library, located at 27333 Center Ridge Rd, Westlake, OH 44145. For more information about events happening at the Porter Public Library, check out their website here. The LEGO festival Build It! is currently happening at the Great Lakes Science Center and NEOLUG’s own Todd Wolf went on Cleveland’s Channel 3’s Live on Lakeside to promote the event. Check out the video, which featured Todd’s massive Stan Hywet Hall model, here. From May 27 through June 4, the Great Lakes Science Center will be hosting Explore It!, a LEGO® exhibit for kids and adults of all ages. The exhibit is included in the price of general admission and will feature creations, workshops, and more from NEOLUG members and LEGO® artists from around the United States. The Great Lakes Science Center is located at 601 Erieside Ave, Cleveland, OH 44114. For more information about the event, please visit the Science Center’s website. NEOLUG’s very own Wayne Peltz was featured in this month’s Mimi Vanderhaven, a monthly magazine run out of Brunswick that features locally-owned businesses in Northeast Ohio. The article (shown on the left) highlighted Wayne’s recent mosaic of the Cleveland Indians’ shortstop, Francisco Lindor and dove deep into Wayne’s personal building process. Below is a reprint of that Mimi Vanderhaven article written by Kelli Comer. You can also view the entire April 2017 Mimi Vanderhaven online here. Many Children dream of turning their favorite pastime into something more when they grow up. Wayne Peltz did just that with the creation of One By 1 LEGO® Mosaics. His innovative, realistic LEGO® works of art represent people in stunning mosaic form. Little did he know his hobby would turn into something much bigger. Wayne works in the visiting clubhouse for the Cleveland Indians, so he regularly rubs elbows with key players in the major leagues. Wayne’s love of sports and his daily ability to circulate among some of the world’s most talented athletes, along with a desire to find an outlet for his creativity, all merged for a creation of the One By 1 brand. The residents of Northeast Ohio aren’t the only ones impressed with Wayne’s talent. A majority of his clientele are the very athletes depicted in his work. “I do sell my pieces upon request, but I create very few pieces that aren’t purchased by the athletes themselves,” Wayne explains. In 2014, Wayne created a special LEGO® mosaic for MLB great Derek Jeter’s last season, which served as the farewell gift to Jeter from the Cleveland Indians. The mosaic captured Jeter’s very first home run hit off Cleveland pitcher Dennis Martinez on April 2, 1992. Wayne participates in TribeFest each year, an annual event for fans held by the Cleveland Indians at the end of January. This year, the fans helped Wayne construct a new mosaic at his interactive booth. Wayne is often asked which of his works was the hardest to create. Although his fandom and clientele happen mainly by word of mouth, you can email Wayne at wayneslegos@aol.com for any inquiries. Wayne’s work can be found on Facebook at One By 1 LEGO® Mosaics. You can also see his work by following @WaynePeltz on Instagram. The International Women’s Air & Space Museum will be hosting its annual FREE community event, Family Day, on May 6, 2017, from 10:00 AM to 2:00 PM. This year’s theme is “Soaring Into the Future.” According to the Museum, kids can enjoy games, activities, crafts, entertainment, education, and community resources at the event. This year, NEOLUG will be featuring several LEGO® creations during the family day event, including space-themed creations and a Rosie the Riveter style mosaic called “Rosie the Builder” built by Abbie Bocan of Abbie Dabbles. To see NEOLUG’s display and take part in the Family Day event, head over to the Burke Lakefront Airport, Rm 165, 1501 N. Marginal Rd. Cleveland, Ohio 44114 on May 6, 2017. For more information about the event, visit the Museum’s website here. Our LEGO® Creeper is made from more than 10,000 green 2×4 LEGO® bricks as well as a handful of green plates and black bricks. NEOLUG member Adrian Drake acted as the lead designer for this collaborative group build. Armed with only the total number of green bricks that the club possessed, Adrian determined the maximum size that our creeper could be. Then, he set the group to work building green boxes of various dimensions. The head, for example, is 64 studs wide by 53 bricks tall. 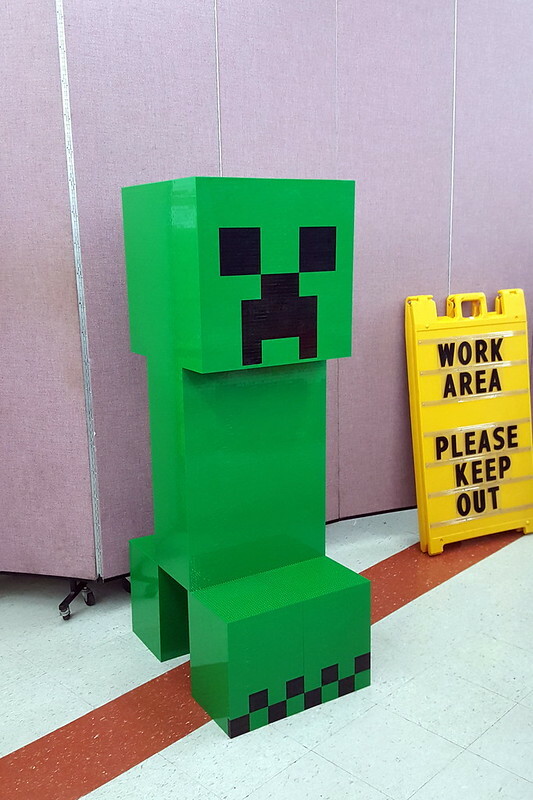 In total, there are four boxes that serve as the Creeper’s feet (with pixelated toes), and a large torso and head. From start to finish (including the time it took Adrian to “crunch the numbers”) we were able to completely build and assemble our LEGO® Creeper in just under 2 hours. NEOLUG’s life-sized Creeper was featured in Brick Journal and is currently on display for a limited time only at Sir Troy’s Toy Kingdom in Canton, Ohio. To see more photos of NEOLUG’s Minecraft Creeper, including photos of the building process and assembly, check out NEOLUG’s Flickr page.